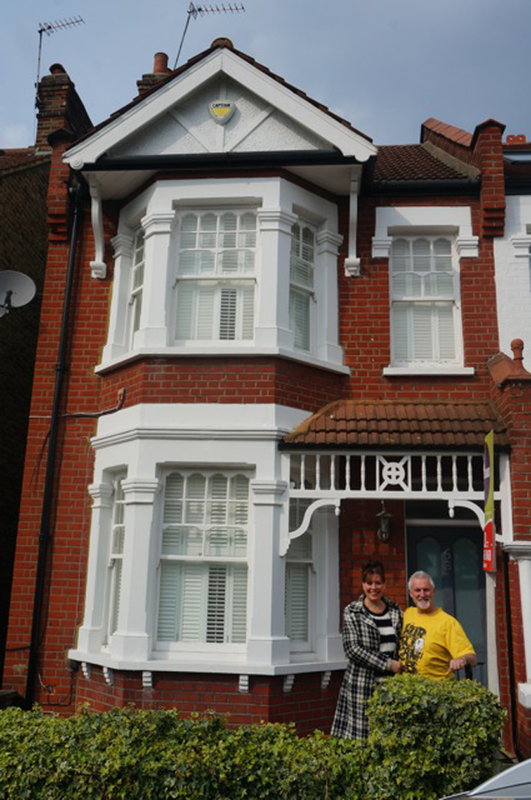 This is the story of the latest house I found – for John and Jane in Wimbledon. John and Jane work long hours – Jane travels a lot and John works in the city. They only had late evenings to find a property. They were referred to me by interior designer Siobhan Casey (from Casey and Fox) back in January. Siobhan advised John and Jane that if they were serious about moving they had to employ a property finder. I met John and Jane on the 3rd of January, and I got an initial sense of what they were after. They wanted to live in Wimbledon – where they had been renting for a few years. When you think Wimbledon, the first thing you usually think about is tennis (go on, admit it!). When I started to really get to know the area, I found “Poets” such as Tennison and Milton, “Battles” like Trafalger and Nelson and “Apostles” – these are some of the different areas within Wimbledon where streets are named according to a theme – which I think is pretty cool! Out today viewing with "Ministers, Poets, and even Apostles!" If you live in #wimbledon you will know what I mean…. Wimbledon Village is the most sought after area in Wimbledon, with the highest price per square foot, but John and Jane wanted a bigger space so we looked at some of the other areas. I have to say, they were great clients. They really listened to my advice (even though they knew Wimbledon better than I did, having lived there for the last 4 years) – they trusted my experience – knowing the process of finding and bidding for the right property with minimal time wasted and combining value for money with the getting the right feel for them. At the end of the first day I sent them this picture to show them the Wimbledon view of the sunset. 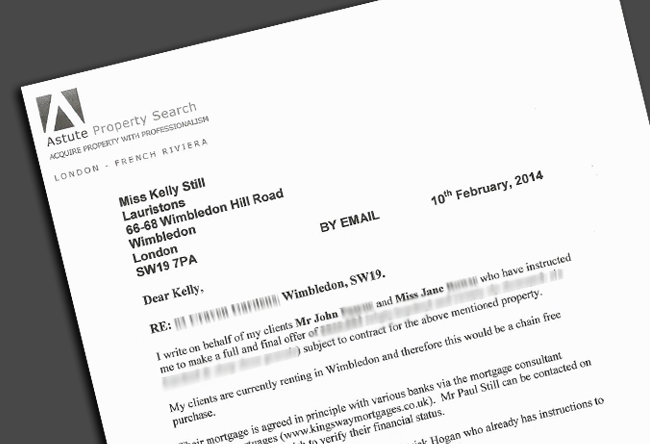 I set about registering with every agent in Wimbledon and getting to know them and the local market. It’s very important that I did an initial viewing day with John and Jane to get an even better idea of their expectations – size, prize, value for money, and area. After this, I had an even tighter brief of what they were looking for – and I could preview properties on their behalf, saving them time doing the running around. In doing this and forging relationships with different agents, I also got a sense of which agents would have the right style of properties. I viewed around 30 properties over a few weeks. As the London market is very busy, agents in Wimbledon tend to hold open days – they know there is more demand than supply. This provides a 15 minute slot to view the property. It was on one of these open days – on a Saturday – when John and Jane saw what they wanted – a 3 bedroom end of terrace house in the South Park Gardens area. There were around 42 viewings that day – so I knew it would be competitive. The house was a perfect size for them and has the potential for a loft conversion – a great selling point for any future buyers. We had found our house, listed by from Lauristons Estate Agents and there was a “best bid scenario” for anyone interested in this house. I had looked at average prices per square foot and had an excellent understanding of the value and pricing of the houses in the immediate vicinity. All the bids had to be in at 12:00 on the Monday. In the best bid scenario it’s important to be prepared and not get carried away, and know your absolute maximum. There were numerous bids – and I drafted an offer letter adding specific information which I thought would sway the vendor (top secret of course!). The next day, the Tuesday, we were pleased to see we had the winning bid and had secured the property! This was of course only the first step. Once our bid was accepted, we had to go through the legal process. In many cases this can be more challenging than finding the property. I managed this process for my clients – including the mortgage valuation (working with the mortgage broker – the excellent Paul from Kingsway Mortgages), structural survey, making sure the legal documents were in order (we had to have a good lawyer on board – Peter Burton from Rice, Jones & Smith). It’s also important to maintain a good relationship with the agent, whose job is to liaise with the vendor and give clear feedback to us, and we found Kelly (from Lauristons) to be very professional throughout. In fact, she is one of the best agents I have dealt with. So there you have it. The story of John and Jane in Wimbledon – with tweets! I hope you have enjoyed reading this as much as I enjoyed living through the experience. I wish John and Jane many happy times in their new house! The not so obvious professional you hire when getting a divorce. Why would you pay someone a fee to find you a property?